Warren’s Tree Care of Kingwood is your ultimate solution for Pine Bark Beetles. 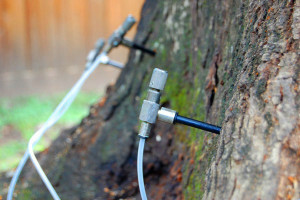 Our proprietary system for tree trunk injection is like no other. The Drill, Plug, Inject method is far more effective than any other method available. Serving the following areas in and around Kingwood, Humble, Atascocita, Summerwood, Eagle Springs, Lake Shore, Porter, New Caney, Huffman and Fall Creek. Warren’s tree professionals encourages you to use the simple “Contact Us” section to the right and we will contact you shortly! The Southern Pine Bark Beetle is an insect that attacks pine trees. They are attracted to drought stressed trees or distressed trees. The Southern Pine Bark Beetle is approximately the size of a grain of rice and bores a hole through the bark and into the Phloem, Cambium and Xylem layers of the Pine tree. These layers are the vascular layers of the tree (like our veins and arteries). Although small, the Southern Pine Bark Beetle attacks the tree in large numbers so that the number of bore holes in the tree is in the hundreds to thousands. Ultimately the vascular layer of the tree is interrupted to the extent that nutrients are no longer able to make it to the trees foliage and the tree dies. This takes as little as 14 days from the time of entry. By the time you notice the infestation it may have already been 10 days or more. Call (281) 354-7111 Today! What does Warren’s Tree Care do? Application cost is based on product used, trunk diameter, and labor for application. Contact us for a free estimate! Specializing in full-service tree care for many years, Warren’s Tree Care is always the first name that comes to the minds of scores of homeowners across Kingwood. Contact us today at (281) 354-7111 for free tree inspection services, including preventive measures to fight pine bark beetle attack, so that our service representatives are able to serve you to the best of their abilities. We will be right there to assist you with your tree care needs!